As Israel prepares for the last day of Passover, blue and white flags are going up in the streets and on the highways as the country gets ready for the 71st anniversary of its establishment in 1948. 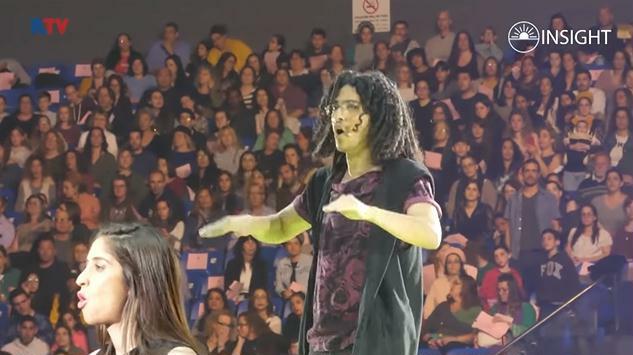 We have fond memories of all the new music videos that were released just a year ago for the 70th anniversary, especially the Koolulam production that brought together 12,000 Israelis from all walks of life who hadn't met before to sing together in a special event with the artist Shlomi Shabat, accompanied by the Jerusalem Street Orchestra. Koolulam has been bringing people together for two years. It's a social-musical initiative aimed at strengthening the fabric of society. The project centers around mass singing events in which large groups of non-professionals come together to form a single collaborative musical creation. Koolulam brings together people from all walks of life to do one thing: stop everything for a few hours and just sing – together. At Koolulam, the audience is the artist. 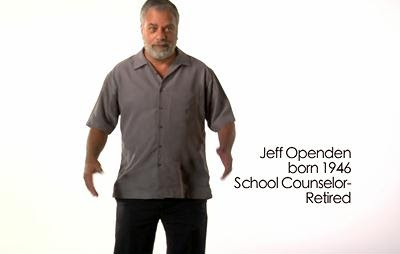 Every participant enters as a unique individual and comes out, while still unique, as a part of a larger whole. For every Koolulam event, a different well-known song is chosen to be performed. 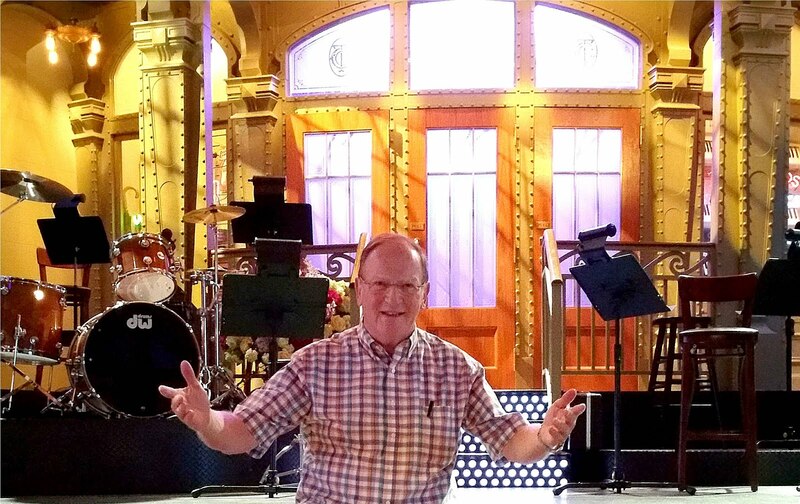 The musical team works hard toward each event, putting together a fresh and innovative arrangement of the chosen song. They write new instrumental arrangements as well as an original three-part vocal arrangement. This ILTV video tells the whole story. Enjoy! 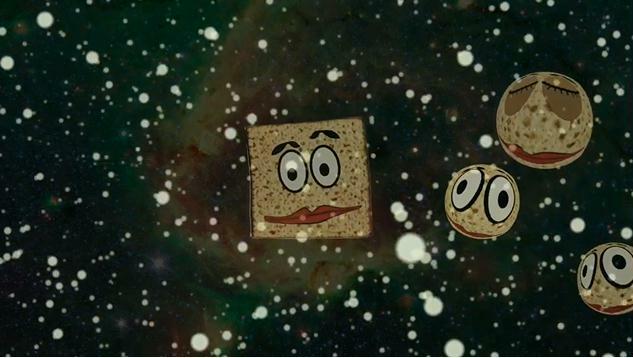 We wish you a happy and kosher last day (or days) of Pesach and Shabbat shalom. We'll be back with a new blog post on Sunday. 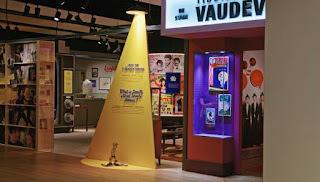 The exhibit, which fills a few large rooms in the museum, pays tribute to Jewish humor around the world with particular focus on comedy in America and in Israel.Equal time and space is given to the great comedians, films, and TV shows of Israel and America. 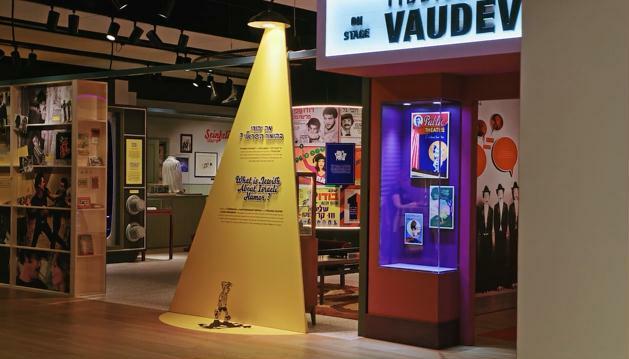 Film clips of classic Israeli and American movies are scattered throughout the exhibit. 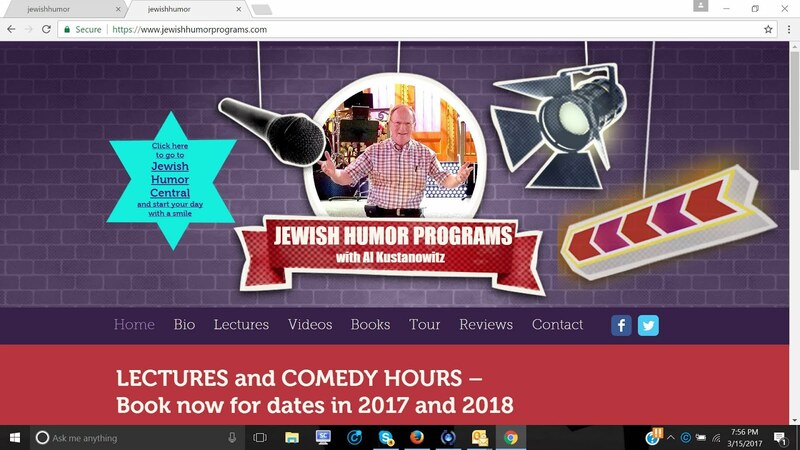 Notable among them are the Seinfeld TV series, Woody Allen in Annie Hall, Jerry Lewis as The Bellboy, Keeping the Faith, the comedy skits of Hagashash Hahiver, Ephraim Kishon's classic comedy The Policeman, TV news satire Eretz Nehederet, and the hilarious, irreverent series The Jews are Coming. 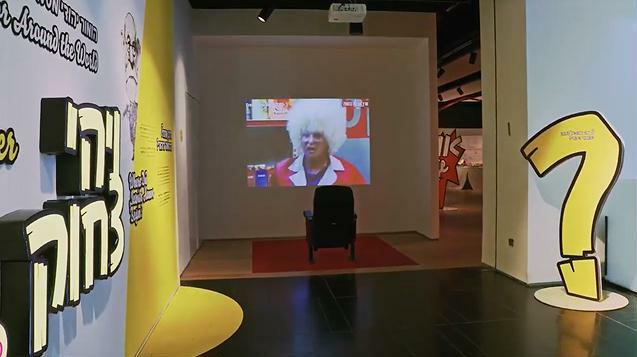 Right in the middle of the exhibit is a replica of the darkened room of a comedy club, complete with small tables and chairs and a stage on which realistic holograms of Israeli comedians deliver their standup routines with a monitor to the side that displays running subtitles in Hebrew and English. Join us for a quick video tour of the exhibit by curator Asaf Galay as shown on Arutz Sheva TV. Israelis are preparing for the main international event of the year -- the Eurovision Song Contest in Tel Aviv. Last week, in Antwerp, Belgium, the Jewrovision contest took place with some 200 participants - Jewish youth from nine European countries. The 20th annual Jewrovision was sponsored by World Bnei Akiva (WBA) and sponsored by the KKL-JNF Education Department. This year’s theme was "Freedom" and the participating songs dealt with related content. This year’s winner, a song titled “Kid”, sung by the Dutch participant, tells of a Jewish child (symbolizing the Jewish people) who is unable to find his place in the world, has no home or a place where he can be truly free. The main theme is the hope that although the child still has no home of his own and despite all the hardships he has endured, the child will eventually find a state in which he can live as a free man. The Eurovision contest will take place in Israel at the Tel Aviv Fairgrounds from May 14 to May 18. A Joke to Start the Week - "Nice Nuts"
Another Monday, another Joke to Start the Week. 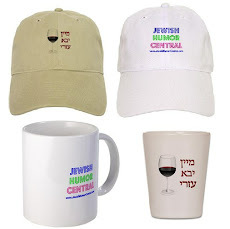 This one's a groaner from the Old Jews Telling Jokes collection. Kerry Bar-Cohn is the only female chiropractor in Ramat Beit Shemesh near Jerusalem, where she lives with her husband David and four sons. But that's only her day job. 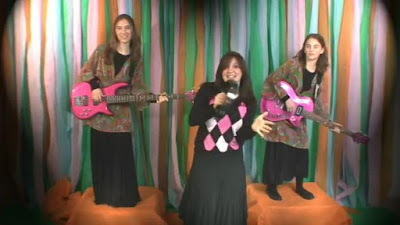 As "Rebbetzin Tap," she produces music and dance DVDs for children, as well as online courses and a plethora of YouTube videos, whose goal is to emphasize the “joy” component in Judaism and in life, and to teach self-esteem and empowerment. She has a background in stage performance, first as a child, then attending the High School of Performing Arts in New York, and subsequently returning to performance ten years ago after making aliyah. Kerry has performed for children, teens and adults around the world, giving concerts and inspirational talks. She also recently started the Kol Isha Facebook group, where women and girls can post their singing and dancing with one another. The group has drawn thousands of members. In this pre-Pesach video, Kol Isha dances to celebrate the coming of Pesach in a kitchen completely covered in aluminum foil. Enjoy, have a kosher and happy Passover and Shabbat Shalom wherever you are. We're in Israel, celebrating one seder and the first day of Pesach on Shabbat. Most of our readers are in other countries and celebrating a second seder Saturday night and observing the second day of Pesach on Sunday. So we're taking a break from posting until Monday. See you then! We're glad that today, the day before the Passover seder, is Throwback Thursday because it lets us turn back the clock to 2015 and let us revisit one of our favorite Saturday Night Live skits. 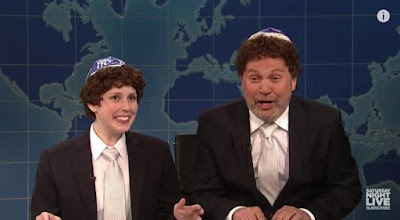 It's the one when Billy Crystal paid a surprise visit to Michael Che's interview of Vanessa Bayer in the role of Jacob the Bar Mitzvah boy. In the skit, Jacob gives a deadpan explanation of Passover. Watching Billy in his role, it quickly becomes apparent where Jacob got his quirky and awkward style of reading his script and handling his interviewer. Today's Passover music video is a unique interpretation of Ma Nishtana, one of the focal points in reading the Haggadah on seder night. This outer space version is by performance artist Ronley Teper, who was born in South Africa and grew up in Toronto. A musician and performance artist, she has been an active member in the international arts scene for over two decades. Over this time, she has recorded five independent LP's and composed and performed works for puppet theatre in both Summerworks and Fringe Festivals in Toronto and Montreal. She also has had musical placements in television, documentary films, and a few video games. She was a guest speaker at the first TEDx talks in Bangkok, Thailand, She regularly performs across parts of Europe and Canada and occasionally Israel. She has participated in a variety of collaborations and artistic residencies in Iceland, and Mexico both performing music and exhibiting installation works. This version of Ma Nishtana is a collaboration between Ronley Teper and Video Artist Saúl Lederman. 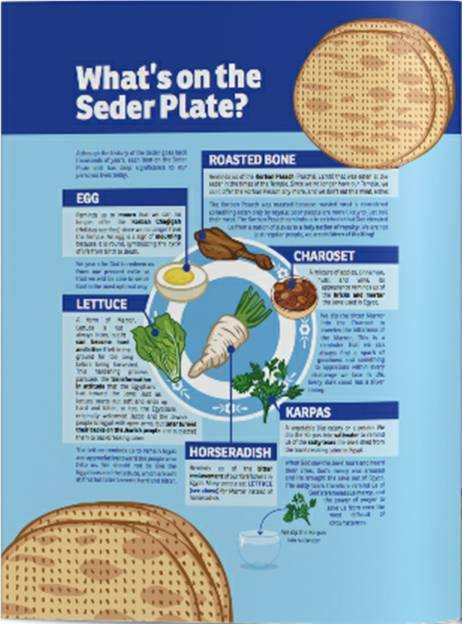 Are you tired of celebrating the Passover seder with the same old Haggadah each year? This week you can break out of the old routine and liven up your seder with a new look, new points of view, and openings for discussions and lively conversation. Jonathan Gorfinkel, a cartoonist whose work appears each week in The Jewish Week, and editor of Batman Comics for many years, has published Passover Haggadah Graphic Novel, a 170 page volume that will greatly enhance your seder. 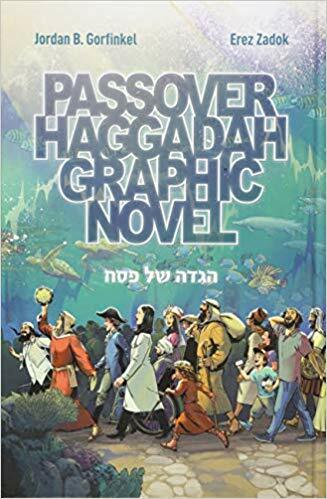 Illustrated in gorgeous color by Israeli artist Erez Zadok, the Passover Haggadah Graphic Novel integrates a brand-new, modern translation into sophisticated and super-fun sequential art that brings the epic story to life. The result of extensive historical and linguistic research, every gorgeous panel imbues the classic narrative with renewed relevance and excitement. 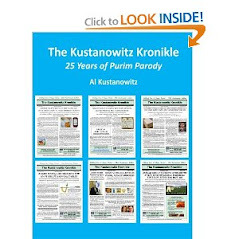 The graphic novel pages are presented alongside the unabridged, traditional Seder service text, in Hebrew and transliteration, and accompanied by how to instructional cartoons depicting all of the rituals, as celebrated every year for the last 4000 years in Jewish homes around the world. Another Haggadah with a fresh viewpoint is Just One, a Haggadah created for the National Council for Synagogue Youth (NCSY) by Rabbi Dovid Bashevkin, is designed with a clear focus on "just one" idea, making each page and moment in the Seder come alive. This Haggadah is perfect for a teen, college student, or any family that wants fresh new ideas to inspire their Passover experience. 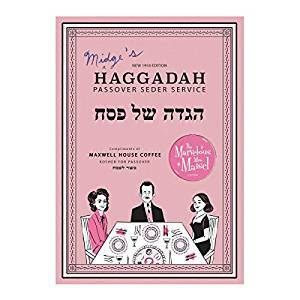 The outpouring of praise for the Netflix series The Marvelous Mrs. Maisel has resulted in a partnership between Amazon.com and Maxwell House to produce Midge Maisel's Haggadah, a limited edition version of the Haggadah that Maxwell House has been distributing for 85 years with the purchase of one of their coffee products. The Haggadah, with a pink cover, has illustrations depicting the members of Midge's family and a drawing of her agent Susie Myerson as Elijah the Prophet. 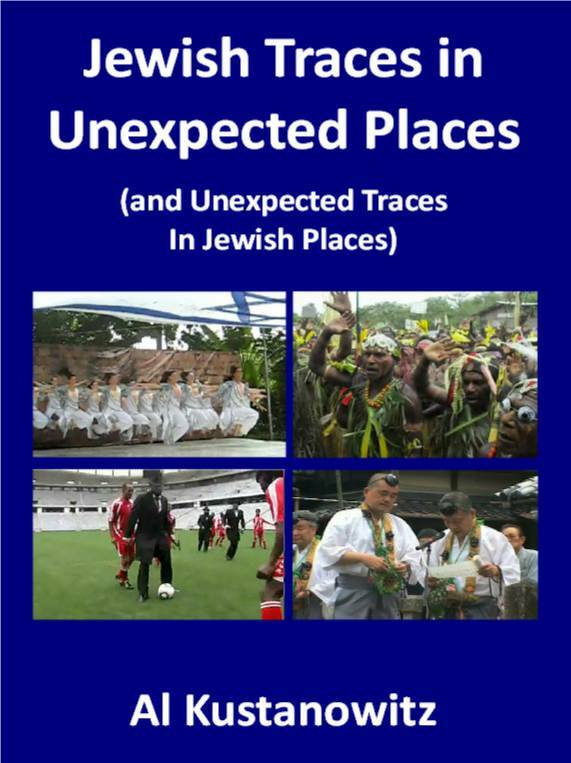 It includes the complete traditional text in Hebrew and English. In this video interview, Jordan Gorfinkel explains why and how he started the graphic novel project and talks about the relationship between comics, superheros, and faith. 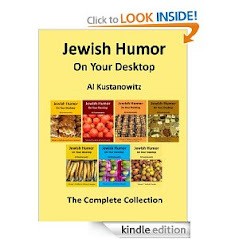 A Joke to Start the Week - "A Little Hoo-Ha"
It's Monday morning and as usual we're starting the week with a new old joke, once again from the annals of Old Jews Telling Jokes. This one comes from Barnett Hoffman, a New Jersey attorney and retired judge. 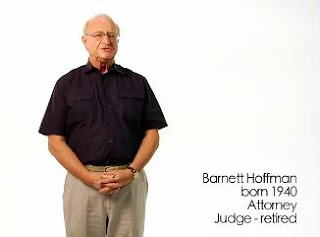 Hoffman's son, Sam, is the founder of the Old Jews Telling Jokes empire, including the website, book, CD, and DVD which were the inspiration for the off-Broadway show of the same name. 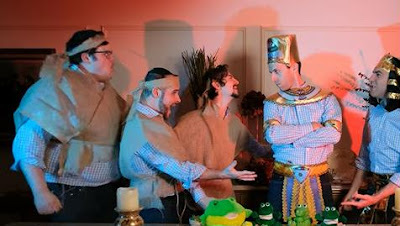 Here Come the Passover Videos: Six13 Presents "A Lion King Passover"
Six13 is a groundbreaking, six-man a cappella vocal band that brings an unprecedented style of Jewish music to the stage, with songs ranging from hip-hop dance tracks to rock anthems. The members of the New York City-based group sound like a full band – while using nothing but their voices. 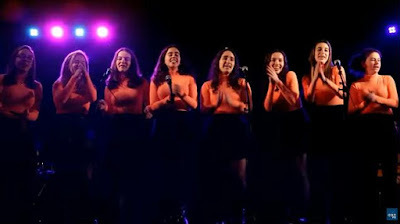 They’re driven by a mission to connect Jews around the globe with their heritage through music, anchored by a strong Jewish identity, and fueled by thumping beatbox, intricate arrangements, and soulful harmonies. Last December we shared Sixa13's Chanukah-inspired parody of Bohemian Rhapsody, the pop song made famous by the British rock band Queen and viewed more than 700 million times on YouTube. Now they've done it again with A Lion King Passover, in which they harmonize singing original Pesach-related lyrics to Circle of Life, I Just Can't Wait to be King, and Hakuna Matata, hit songs from The Lion King. A Joke to Start the Week - "Kosher Butcher"